Play Sit 'N' Go's, climb the leaderboard and win cash and token prizes! Play for huge prize pools with buy-ins as low as €1! There's a new type of tournament whirling around the software, spinning an exciting connection between sit 'n' go action and the thrilling wind of winning a jackpot prize! Twister Sit 'N' Gos are three-seated turbo events, in which a randomly selected prize pool - which could be worth up to 1,000 times the buy-in amount - is up for grabs. Get even more out of the fun and exciting Twister Poker action with the all new Twister Races! Join the action every week from Monday to Sunday, and compete for a share of €12,500 in guaranteed prizes. The more Twisters you play, the more chances you have of grabbing the top prize! 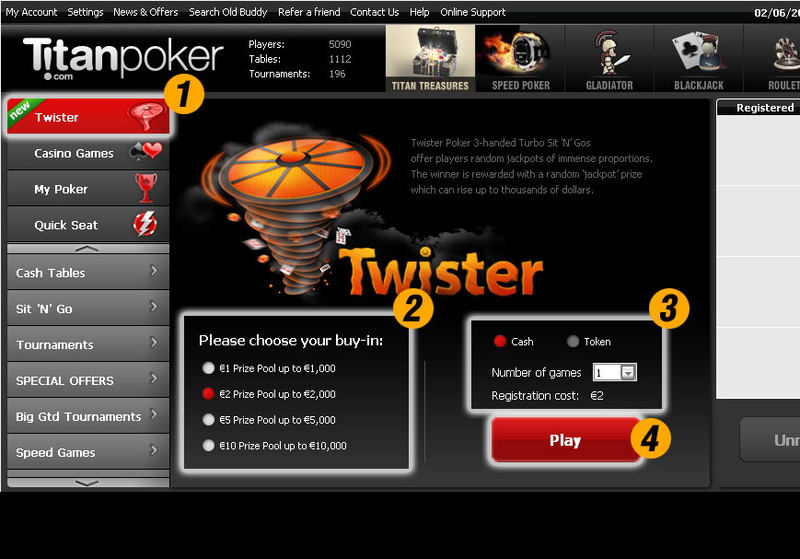 Click on the "Twister" tab in the software, select your buy-in amount and choose the number of games you want to play. Play a €1 Twister sit 'n' go and you could win up to 800x your buy-in. Play a €10 Twister sit 'n' go, and you could win an €8,000 prize. It's as simple as that. At the very minimum, the winner will double his/her buy-in! Player wins a €10,000 Twister Prize! Lautaro "lauchon33" Mayon from Argentina reveals the strategy he employed when he won the biggest Twister prize of all. Also, it's entirely possible to win the smaller Twister jackpots. Armando "ILoveJB" Ferreira tells us how he won a Twister jackpot prize. Twister Sit ‘N’ Go tournaments carry different prize pools and payouts are randomly allocated at the beginning of each tournament. Titan Poker will pay up to €8,000 to the winner of a Twister Poker Sit ‘N’ Go tournament. The grand Jackpot prize pool will equal as much as 1,000 times the total Buy-in + Fee amount and there are 4 different Buy-in’s: €1, €2, €5, €10. Any winnings including the grand Jackpot prize will be paid automatically into the winner’s Titan Poker account at the end of the tournament. The prize pool will be presented at the beginning of each tournament. Prizes for the winners of Twister Sit ‘N’ Go tournaments range from Double Buy-in + FEE up to and including 800 times the Buy-in + Fee. Twister Races prizes will be issued to the winning players up to 24 hours following the completion of each race. In case of equal points, the player with more Twister tournament entries during the qualifying period will be ranked at the higher position. 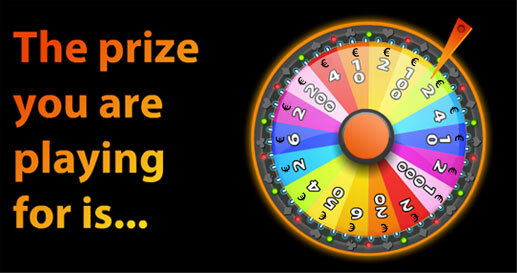 The amount shown on the Twister SNG wheel is for illustration purposes only. The amount shown on the table is the actual prize awarded. Any withdrawals made on any winnings of the Jackpot prize are subject to Titan Poker's standard withdrawal procedure. All decisions made by Titan Poker management are final. Titan Poker has the right to stop this promotion, or change its conditions at any time.